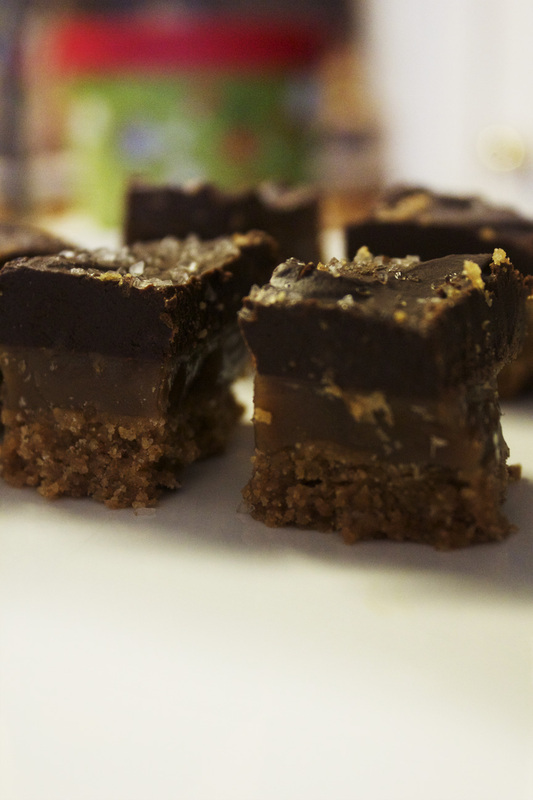 Coffee Caramel Bars… Three layers of goodness. There’s no way this could taste bad… Graham Cracker Crust, Caramel in the center, Chocolate on top. Can you say RICH?… Yes, but if you are going to indulge you might as well do it right. This recipe is a bit of a process but if you break it into the layers it’s much easier. My advice after making it: Get all your ingredients out and measured as much as is possible so you can move from layer to layer more seamlessly. Preheat your oven to 350 degrees F. Line the bottom of a 9-inch round springform pan with parchment paper. Spray the paper and the sides of the pan with cooking spray. Just do your best cutting out a circle to fit the bottom of the pan. If it overlaps onto the sides a bit it’s fine! Start melting 1 1/2 sticks of unsalted butter in a small saucepan on the stovetop. Put 12 WHOLE cinnamon graham crackers into a food processor. Pulse the crackers until they are fine crumbs. If you don’t have a food processor you can just put the graham crackers into a zip top bag and crush them into fine crumbs by hand (or with a rolling pin!) If you don’t use the food processor, transfer the crumbs to a small bowl to finish the steps. Add in a 1/4 cup sugar and the melted butter. Mix to combine and then pour the mixture into your prepared cake pan. Use your fingers to pat the crumbs into the bottom of the pan, creating a level surface the best you can (you want it to bake evenly)! Bake the crust in the oven (350F) for 10-12 minutes until it’s golden. When the crust has been out of the oven for about 10 minutes, start your caramel. You can get the ingredients ready to go during those 10 minutes! You can use the same saucepan you used to melt the butter for your graham cracker crust (SAVE ON DISHES!) Put the pan over medium heat and add in 1 stick butter, 1/2 cup heavy cream, 1 1/2 cups brown sugar, and 1 tablespoon water. Stir the mixture during these first minutes until it’s smooth. Then, DON’T stir it anymore! If you do you will reap the consequences… a sticky mess! Bring the mixture to a boil over medium-high heat and let it boil until it reaches 240 degrees on a candy thermometer. This is not the time to go sit on the couch, do laundry, or ANYTHING else! Usually I am all for multi-tasking, but this is not one of those times. Watch your caramel diligently… it will pay off. As soon as the caramel reaches the right temperature pour it right over the graham cracker crust! Just be sure that the crust is COMPLETELY cooled before you do this! You want your layers to stay intact and not get melted together. Allow the caramel to cool at room temperature for 20 minutes and then pop the whole cake pan in the FREEZER for 10 more minutes to let it set completely. Then take it out of the freezer and put it on the counter at room temperature again. Don’t leave it in there or the caramel will harden TOO much! Put about 2-3 inches of water into a medium saucepan and bring the water to a boil. Then bring the heat down to medium and put a heat-proof bowl right on top of the saucepan. This will create a double boiler. Just be sure the bowl on top doesn’t touch the water in the pan. This is important! If it does touch your chocolate won’t melt correctly. The recipe calls for smoked sea salt sprinkled over the top of the chocolate. You only need a teaspoon for the whole thing. If this sounds disgusting to you then just try sprinkling 1/4 teaspoon over 1/4 of the chocolate. The salt really brings out the flavor of the caramel and the chocolate… you’ll see! I only sprinkled salt over half of the chocolate just in case someone I was serving didn’t like it there. You can use regular SEA SALT too if you don’t have the smoked sea salt. This is what I did and it turned out wonderful! Pop the pan into the FRIDGE for about 1 hour and then bring it back out to room temperature for another 30 minutes. Loosen the edges all around the chocolate layer. Then release the springform pan and remove the paper on the bottom. Cut into bars in the shape you desire or try wedges for bigger servings! Click here for the official recipe! If caramel is not your thing… check out these BROWNIES! Here’s the final shot one more time! !